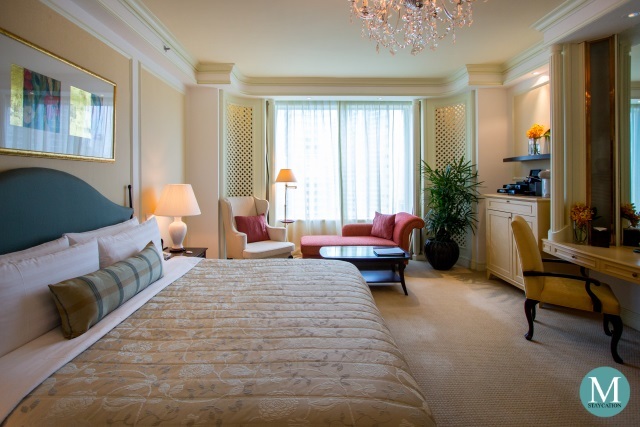 The One-Bedroom Suite is the lead-in suite category of Shangri-La Hotel Singapore's Valley Wing. 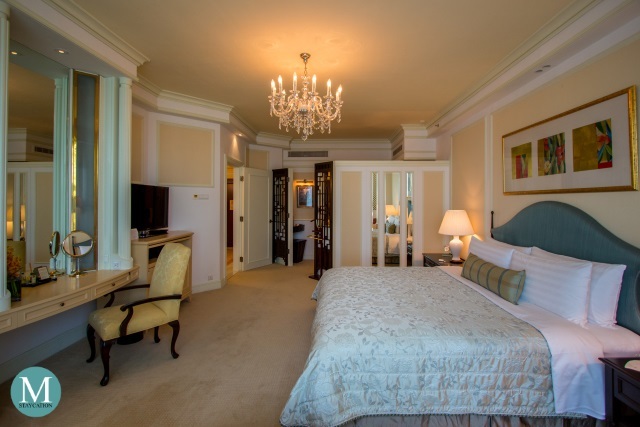 There's a total of 11 Valley Wing One-Bedroom Suites, with each suite measuring about 79 square meters. 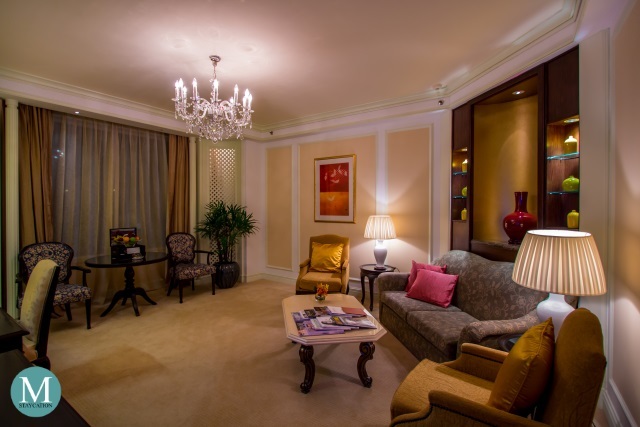 The One-Bedroom Suite is one level higher than the Deluxe Room, the lowest room category of the Valley Wing. 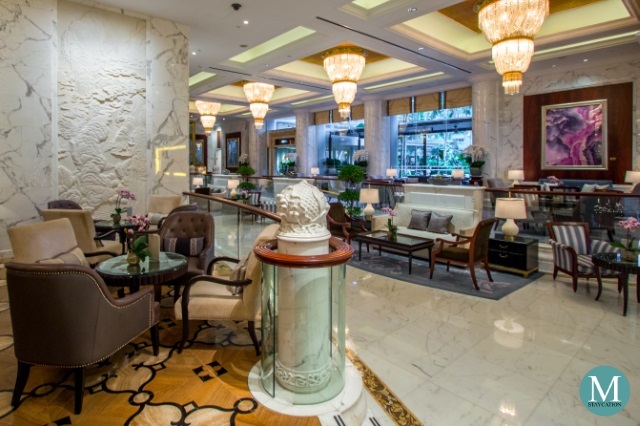 Shangri-La Hotel Singapore consists of three distinctive wings, the Tower Wing, the Garden Wing, and the Valley Wing. 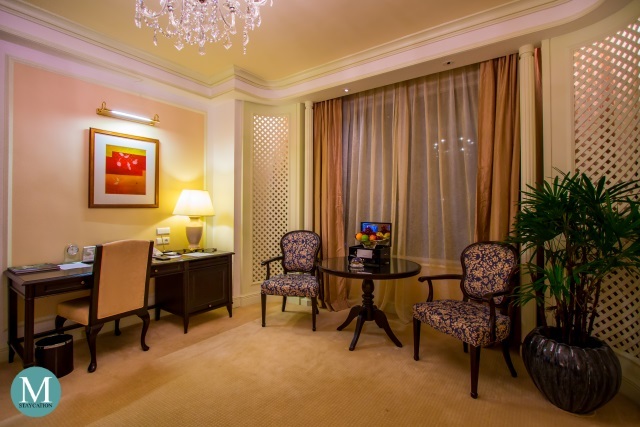 Among the three wings, the Valley Wing is most luxurious, making it the accommodation of choice of head of states, top executives and luxury travelers. 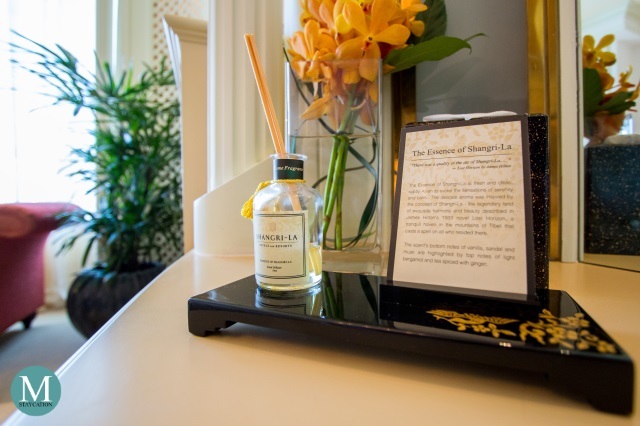 The Valley Wing has its own private lobby with its amenities reserved to the exclusive use of Valley Wing guests. 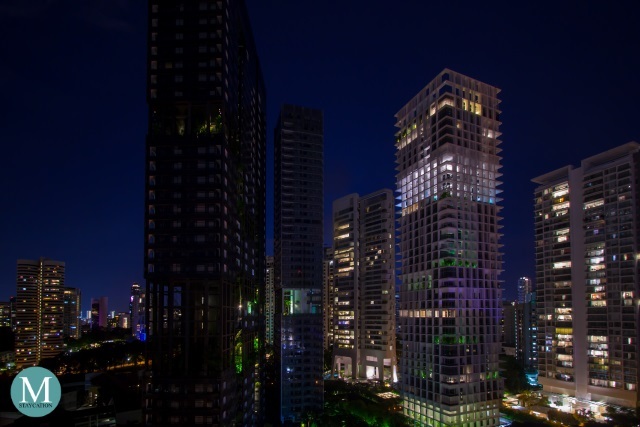 Last November 2016, I had my first trip to Singapore and I decided to spend my last day in the city at no less than the Valley Wing of Shangri-La Hotel Singapore. I didn't plan anything that day so I basically just stayed inside the hotel and relaxed inside my suite. I have stayed in several Shangri-La Hotels before and they never fail to surprise me with their welcome amenities. 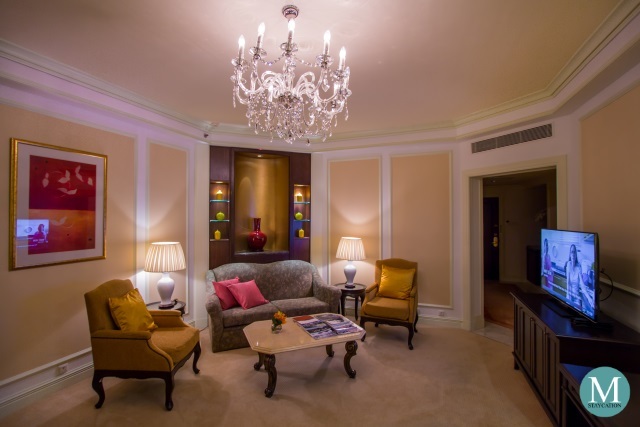 And it also pays to be a Golden Circle member, you can feel the added layer of VIP treatment. Just look at that platter of fruits. 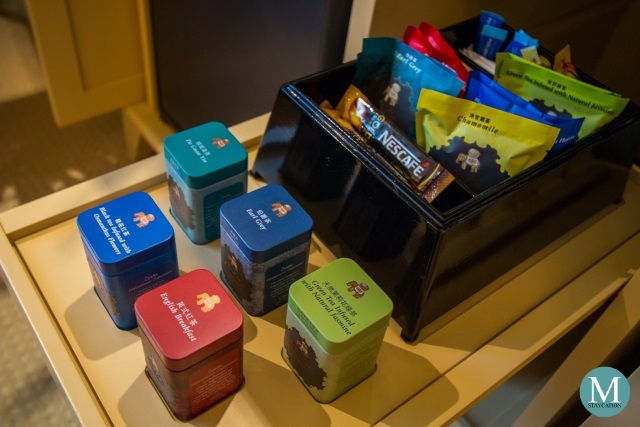 The drawer box is also loaded with chocolate pralines which I only discovered when I was about to check-out the next day, so don't forget to check each compartment of the drawer box. 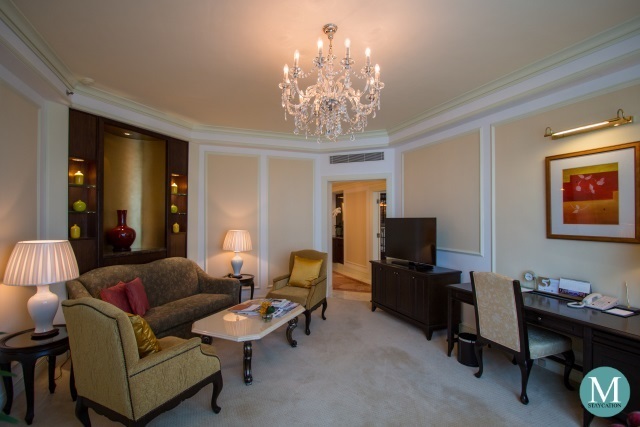 The One-Bedroom Suite has a spacious living area furnished with a sofa, two couches, a marble-top table, a full-size executive writing desk with chair, and a coffee table with two chairs. An elegant chandelier adds more luxury to the space. 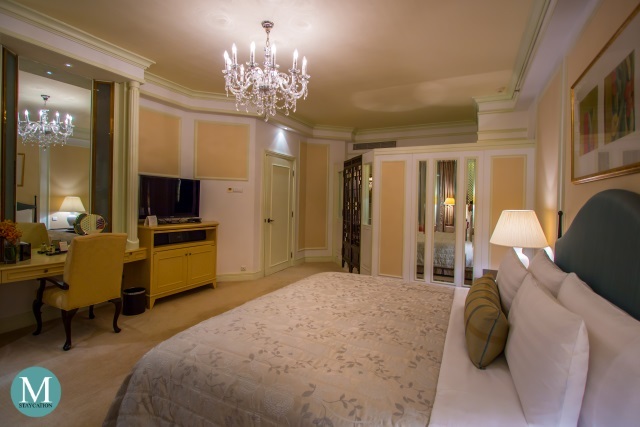 The living area is also equipped with an LCD television with international cable channels. Complimentary WiFi internet is available inside the suite. Lastly, business travelers will surely enjoy the convenience of having an all-in-one fax, printer and copier machine inside the suite. 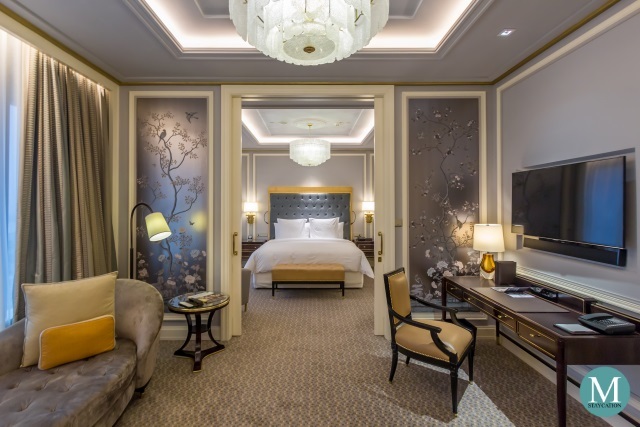 The elegant interior of the suite extends into the bedroom with the subdued colors of the furniture, beige wall and carpet, white cornices, and its own chandelier giving a delicate tone of warmth and luxury in the room. The bedroom has a seating area where you have a choice between a couch or a lounge sofa. The LCD television has international cable channels and is installed with a Hi-Fi sound system. The bedroom also has a writing desk mounted with a huge wall mirror. 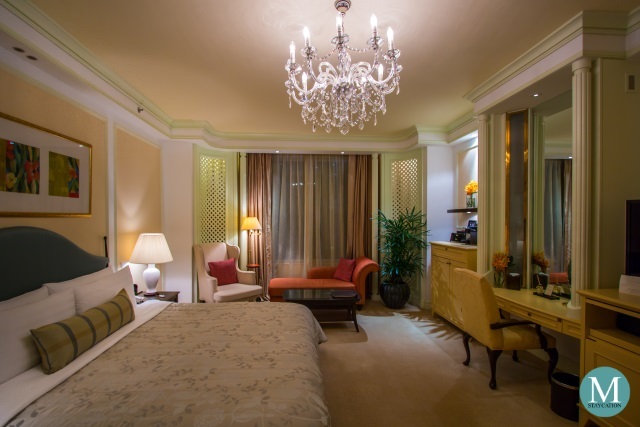 Welcoming you in the bedroom is a scent diffuser which gives the room that familiar fragrance of Shangri-La. 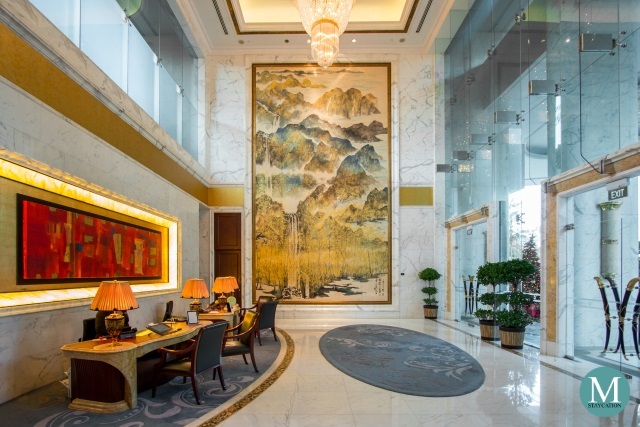 It is the same scent you smell at the lobby of all Shangri-La properties which gives you a feeling of coming home at Shangri-la, wherever you are around the world. 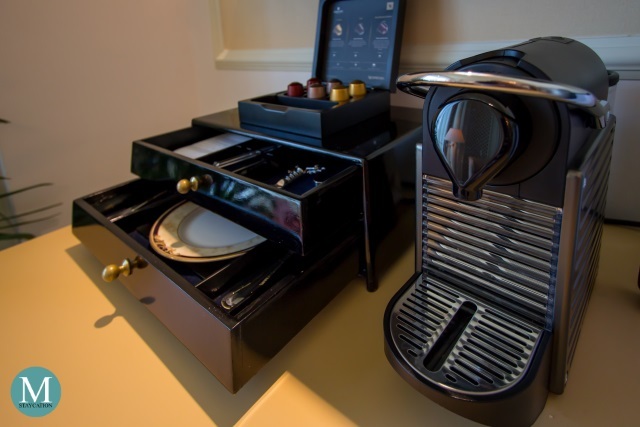 While Valley Wing guests enjoy complimentary all-day refreshments at the Champagne Bar, each room and suite at the Valley Wing is also provided with a Nespresso machine so that guests can prepare their freshly brewed espresso at the comfort of their room. 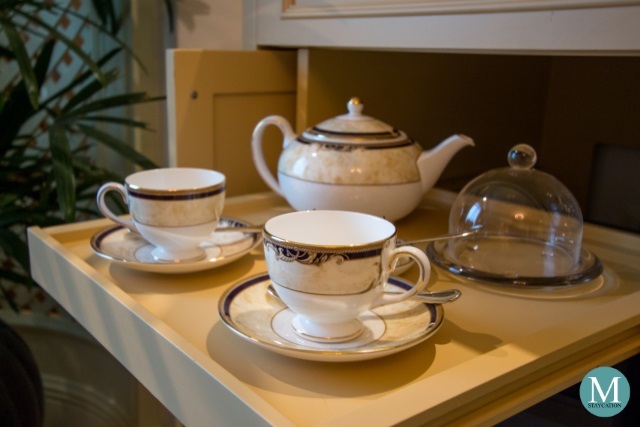 Each room and suite is also provided with an electronic kettle should the guests prefer tea over coffee. There are at least five different variants of Zesta tea provided. There's one set of loose leaf tea in tin cans, and two sets of tea bags as well. Nescafe Gold instant coffee, brown and white sugar, as well as Equal artificial sweetener are also provided. There's a teapot and two sets of teacups stored inside the chest cabinet. If you need to heat water, there are about six bottles of Evian mineral water placed at the alcove closet. 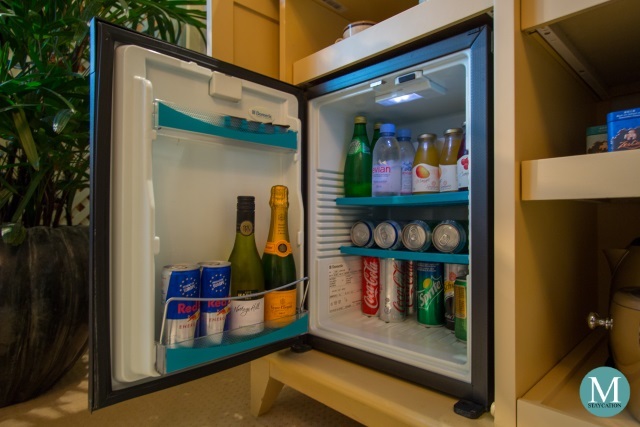 Underneath is a minibar fully-stocked with soda in can, bottled juices, sparkling water and still water. 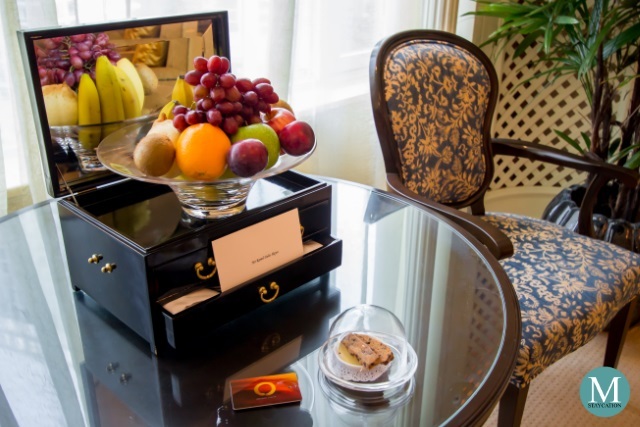 One of the benefits of staying at the Valley Wing is that all items inside the minibar are complimentary, excluding alcoholic beverages and snacks. 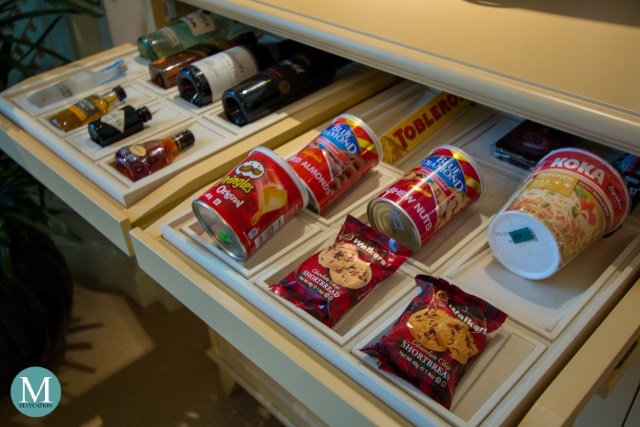 The sliding drawers store various spirits and wines, as well as some snacks of chips, cookies, nuts, chocolates and instant noodles. Again, these items are not part of the complimentary minibar items. You can find the list of prices next to the Nespresso machine. 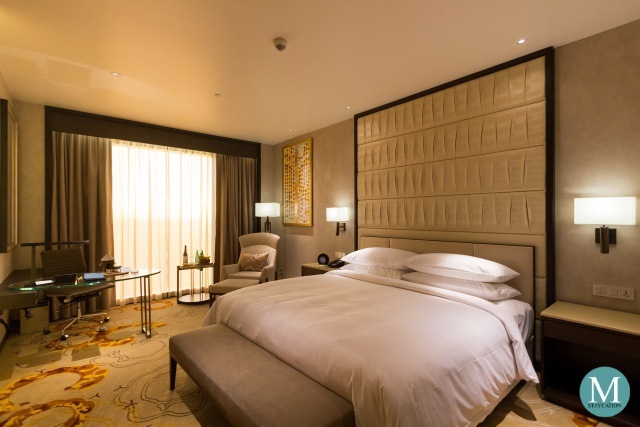 If you stayed in a Shangri-La before, you would know how amazingly comfortable their beds are. But just like everything here at the Valley Wing, the bed, pillows and linens are also taken a notch higher. The mattress has that magic spell that will easily make you fall asleep, so if you have no plans of sleeping yet, don't event try to lie on the bed. Luckily for me, I don't have anything planned for the day. I simply want to relax after days of exploring Singapore. I did not bother asking what the exact threadcount of the linen was, I was pretty sure it was higher than the usual 300 threadcount. One of the things that surprised me about Singapore was the humidity. As soon as I entered the bedroom, I immediately set the air-conditioning to high and lowered the temperature to 18 degrees Celsius. 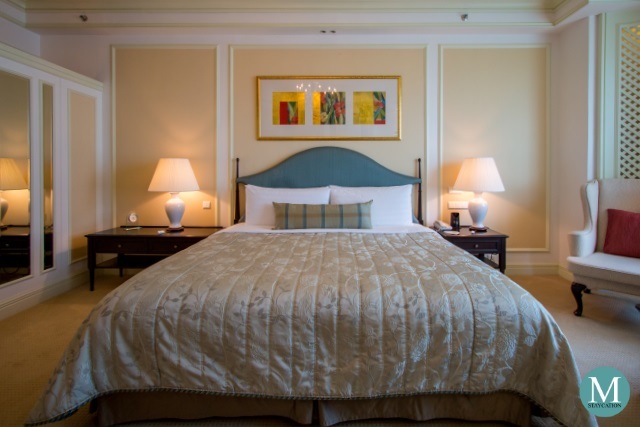 The comfortably cool in-room temperature plus warm covers is my secret formula for a good sleep. Another unique feature of the bedroom is the alcove closet. 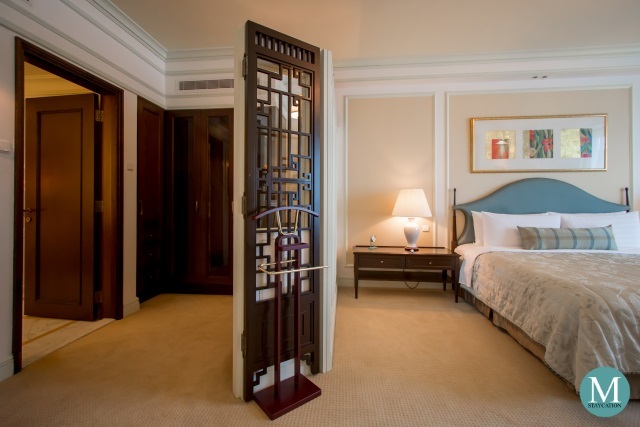 It is a small area that is enclosed with a divider wall with two doors inspired with Asian room dividers. 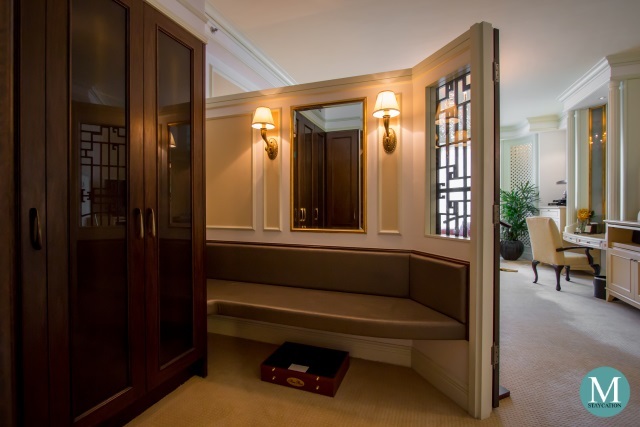 The alcove closet has a seating area where guests can either place their luggage, or actually use as a bench when wearing or removing shoes. 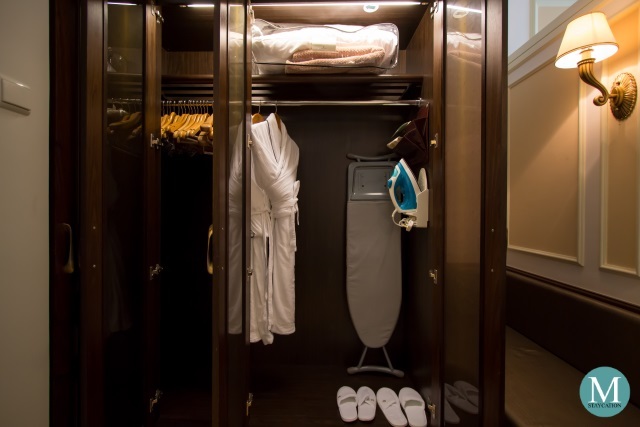 The closet cabinet stores two pieces of bath robes, two pairs of bedroom slippers, several wooden hangers, an iron and an iron table. The in-room safe is also concealed inside the closet cabinet. The alcove closet leads to the private en-suite bathroom. 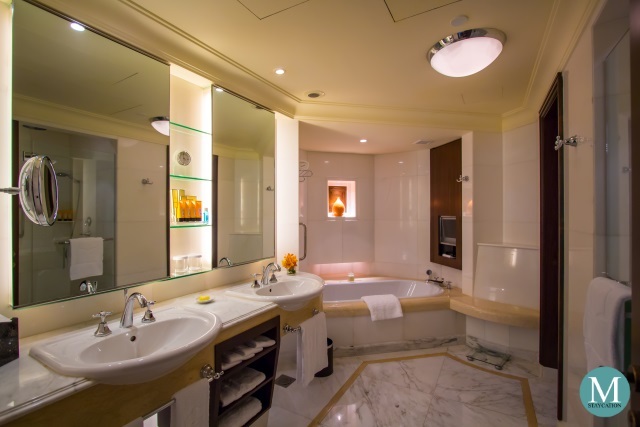 Just like the bedroom and the living room, the bathroom is equally spacious and impressive with its marble floors, countertops and wall. There's double sink fitted with high quality faucets and lighting that can adjusted to your mood. The bathroom has a separate water closet and walk-in shower. 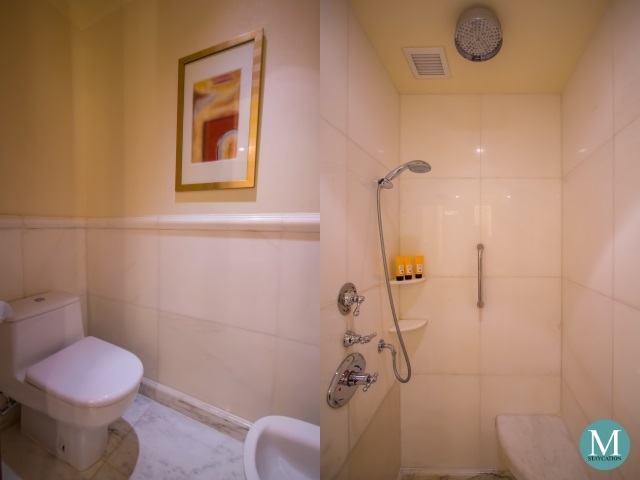 The flush toilet is installed with a bidet spray while a bidet toilet can also be found inside the water closet. The walk in shower is lined with marbles and is installed with a hand-held shower and a rainfall shower-head. Both hot and cold water are available. 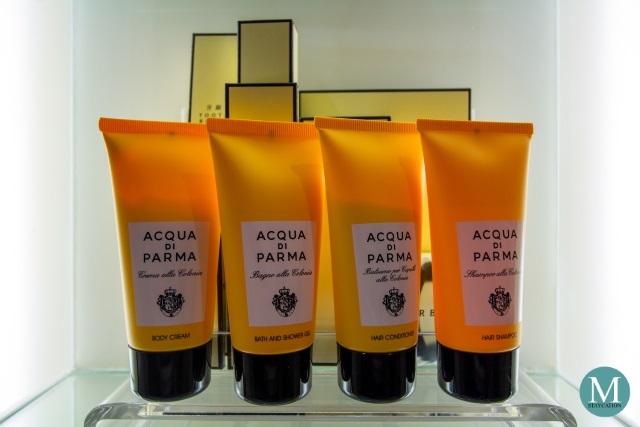 To match the high level of luxury of the Valley Wing, guests are provided with Acqua di Parma branded premium toiletries, further adding to the ultra luxurious and exclusive experience. Acqua di Parma is an exclusive, high society perfume house in Italy know for its high regard to craftsmanship, elegant design and discreet luxury. 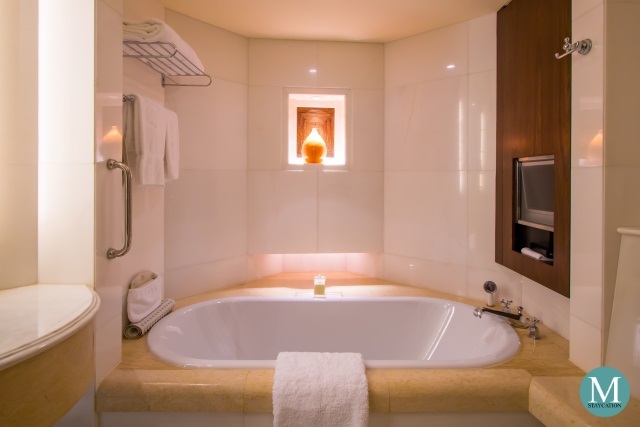 Note that L'Occitane en Provence Jasmin & Bergamot toiletries are provided in Valley Wing Deluxe Rooms while Acqua di Parma toiletries are provided in Valley Wing One-Bedroom Suites and higher suite categories. Highlight of the en-suite bathroom is the soaktub where I enjoyed more than an hour of warm bath. There's an LCD television mounted on the wall but I prefer listening to chillout music while soaking in the tub. Shangri-La also provides bath pillow for added comfort. It was already dinnertime when I finished taking a bath. 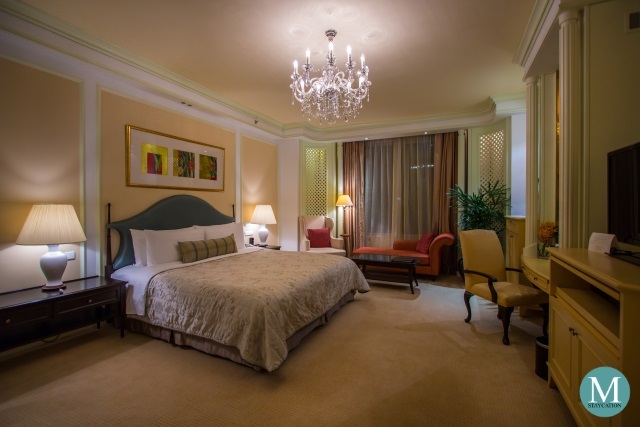 Below are more photos of the One-Bedroom Suite taken in the evening. 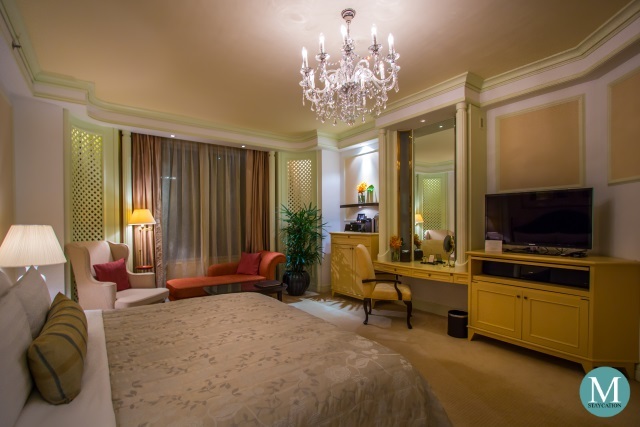 The Valley Wing Deluxe Room is roughly the same size as the bedroom of the One-Bedroom Suite (sans the living area). 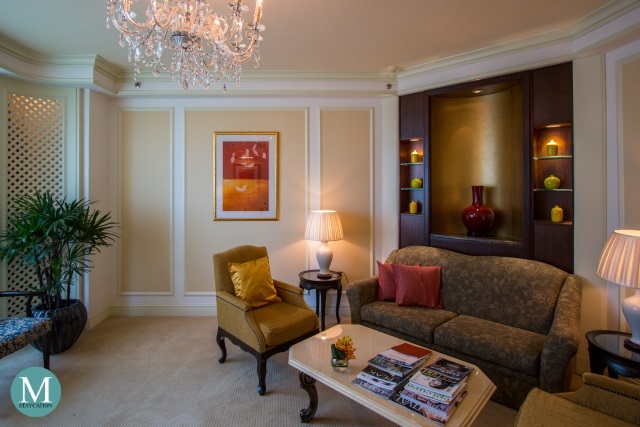 While the One-Bedroom Suite offers more space, I personally feel that it is too big for solo travelers. This is especially true if your will be spending most of your day traveling around Singapore or working long hours at the office. 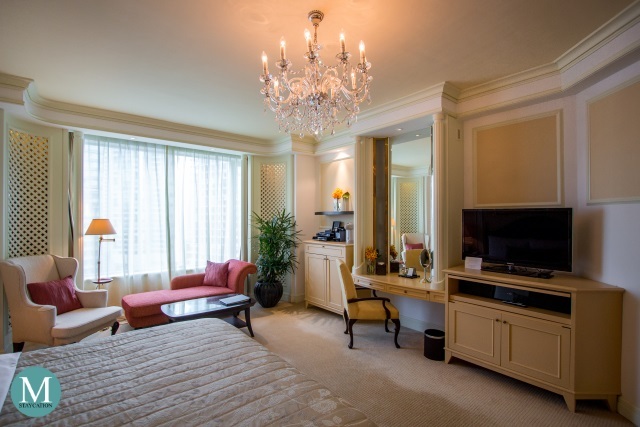 The One-Bedroom Suite is perfect for couples or individuals who are expecting casual visits from close friends or relatives. The spacious living area will be a great venue to receive and entertain them. The Champagne Bar and the lobby lounge on the other hand would be a more appropriate venue for business meetings. If you are staying alone, you can actually extend your Valley Wing privileges to one (1) guest. That's a great way to entertain a business associate or a dear friend. 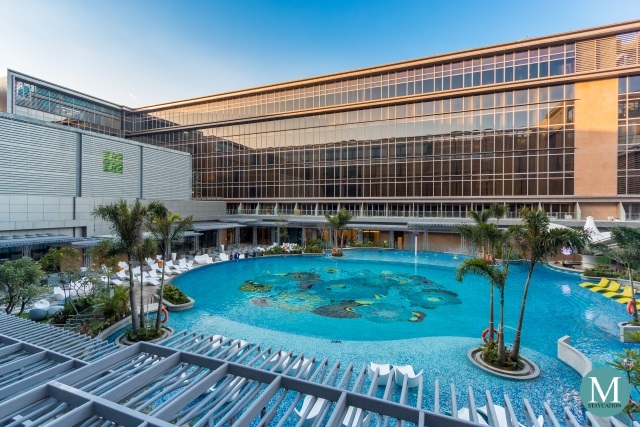 IMPORTANT: Please note that starting April 1, 2017, the Valley Wing will be charging an occupancy fee of SGD 80.0 (subject to 7% GST and 10% service charge) for every child above two years old who will be occupying the same Valley Wing Deluxe Room as the parents. Payment will be collected upon arrival. The fee does not apply to guests staying in a Valley Wing One-Bedroom Suite or higher suite categories. All text, photos, videos, files and other intellectual property rights (registered and unregistered) on MetroStaycation.com are CONTENT protected by copyright. You may not copy, download, edit, rephrase, modify, reproduce, republish, post, re-post or otherwise use MetroStaycation.com content in any way except for your own personal, offline, and non-commercial use. Any other use of MetroStaycation.com content requires the prior written permission obtained via metrostaycation@gmail.com. Copyright 2016-2019 © MetroStaycation.com All Rights Reserved. Simple theme. Powered by Blogger.